It passes with a strong majority, but not enough to be veto-proof and expand health care to 60,000 more Mainers. AUGUSTA – Democrats’ last-ditch effort to extend public health insurance to more than 60,000 low-income Mainers failed in the Legislature on Wednesday, ending, at least for now, one of the more heated battles of this legislative session. The outcome was sealed in the House when a majority of Republicans sided with Gov. Paul LePage in upholding his veto of L.D. 1066, a bill that would have broadened Medicaid, the public insurance program for the poor, through the federal Affordable Care Act. The final 95-52 vote fell three votes short of overriding the veto. Four Republicans voted with the Democratic majority to override the veto. It takes two-thirds of the lawmakers present and voting in both chambers to override a veto. After the vote, House Speaker Mark Eves, D-North Berwick, said supporters of expansion did everything they could. Rep. Kenneth Fredette, R-Newport, the House minority leader, said the vote showed that Democrats had not convinced Republicans of the merits of Medicaid expansion. He accused the majority party of attempting to “muscle it through” the Legislature. “We were appalled by the Democrats’ actions and are united in our belief that those tactics don’t belong here in Maine,” Fredette said. The Medicaid expansion debate has been one of the biggest political battles of this session, with Maine Democrats seeking to join 24 other states in pushing to broaden the program and bolster a key component of the federal health care law. Republican resistance has been fierce, although an amended version of L.D. 1066 was crafted by Sen. Roger Katz, the Republican minority leader in the Senate. By not expanding Medicaid now, Maine will likely lose at least one year of full federal funding, even if it decides in the future to go ahead with expansion. The final vote followed an afternoon session marked by a flurry of parliamentary and political maneuvers as leaders in both parties tried to secure their desired outcome. Democratic leaders tried to override the veto quickly by closing the vote while Republican lawmakers were out of their seats. Republican leaders and their staff rushed behind glass at the back of the chamber to corral colleagues who were wavering on expansion. Fredette at one point scrambled his staff to find Republican lawmakers who “were soft” on expansion and make sure they voted the party’s position. LePage’s staff was also dispatched. Some Republicans tried to “take a walk” during the override vote, a common practice on controversial issues that allows lawmakers to avoid having their votes recorded, while helping the opposing party. Republicans later accused Democrats of trying to ram the bill through and using other legislation as leverage to persuade wavering lawmakers to vote for expansion. Eves said Wednesday that Democrats would do whatever they could to expand Medicaid. But Maine’s participation in Medicaid expansion as outlined in the federal health care law has faced long odds. A majority of Republicans rejected the Democrats’ first Medicaid expansion effort, a bill that would have combined expansion with a bipartisan plan to pay Maine hospitals $186 million in outstanding debt. The compromise crafted by Katz attempted to ease Republican concerns by including federal reimbursement guarantees, an independent cost-benefit study and a “hard sunset” to end the program after the first three years of full federal funding. Republican’s opposition, however, proved constant and fluid, moving from concerns about the federal government’s ability to fund the program to cost overruns in the state’s Medicaid program, MaineCare. 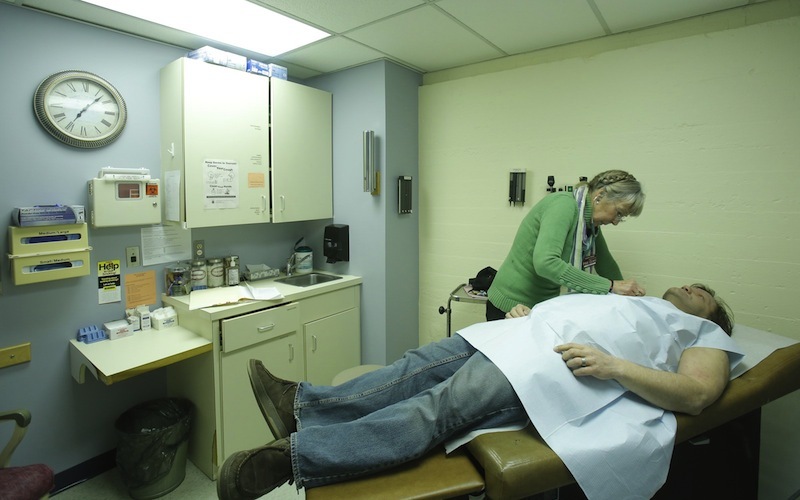 More recently, the opposition shifted attention to a list of severely disabled Mainers who receive health coverage but are waiting for additional services for which they qualify. The waiting list is the subject of a court action filed May 28 that effectively compelled the LePage administration to cover qualified recipients. The state’s next two-year budget proposal devotes about $10.4 million to extend services to residents on the waiting list. Medicaid expansion would extend coverage to adults without children who earn as much as $20,500 a year. Under the amended bill, eligibility would expire after three years, when federal reimbursements for the program are scheduled to decline from 100 percent to 90 percent, unless the Legislature took additional action. Twenty-one states have chosen not to participate in Medicaid expansion this year. Several states are still debating the issue. The Medicaid issue could play into next year’s gubernatorial election. Democratic U.S. Rep. Mike Michaud, who is exploring a run for governor, urged Democrats to fight for expansion and visited the House Democratic caucus in May to push the issue. This week, Michaud released a statement through his exploratory committee asking lawmakers to override LePage’s veto and support Katz’s amendment. “Gov. LePage has said ‘no’ to a plan that would have helped Maine’s economy, protected rural hospitals, created nearly 4,500 jobs and helped to improve the lives of men and women who work, but can’t afford health insurance,” Michaud said. Independent candidate Eliot Cutler also urged lawmakers to override the governor’s veto. “It’s sad that a bipartisan coalition of legislators worked so hard to develop and pass complicated legislation that is in the best interest of all Mainers, only to have Gov. LePage once again make the wrong choice for Maine,” Cutler said in a prepared statement.